The City of Ridgeland has an ongoing schedule for upgrading traffic arteries to achieve efficient traffic flow and to improve safety. While we may have to inconvenience the public with street closures, we believe that they understand that the benefits they will enjoy in the future are worth a temporary inconvenience. We encourage drivers to be patient and courteous during this process, and remind them that their safety and the safety of road crews is of paramount importance. View the Ridgeland Transportation Plan. The City of Ridgeland’s transportation improvement projects will provide appropriate accommodation for pedestrians, persons with disabilities, bicyclists, and motorists. Complete Streets principles will be incorporated into the planning, design, and construction of projects. 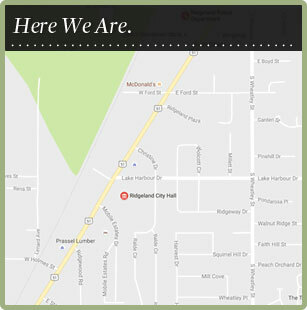 View the City of Ridgeland Complete Street Policy. Traffic counts for roadways in Ridgeland may be found on the Mississippi Department of Transportation website at http://www.gomdot.com/. The City of Ridgeland provides over 17 miles of multiuse trails for the purposes of recreation, fitness, and alternative transportation. The main trail travels east-west across the city near the Natchez Trace Parkway. Connector trails lead off of this main trail to travel along Sunnybrook Road, Pear Orchard Road, Lake Harbour Drive, Old Canton Road and Rice Road. Recreational cycling, walking, running, strolling and in-line skating are some of the many uses of this very popular trail. Clubs, groups, individuals, families and friends of residents and visitors from all over the metro area can all be found on this trail every day of the week. A well-used trail is a safe trail, but the City also adds police protection in the form of mountain bike patrol. Trail etiquette is important for the enjoyment of the trails by all users. Littering is against the law and should be reported to the police if witnessed. Dogs must be on leashes and kept close to their human companion. If the leash is allowed to extend across the trail, it can cause an accident for others. If you use earbuds, please keep one ear open so you can hear someone approaching. Bicyclists should let walkers know when they are passing by saying, “on your left”. If there is an emergency, call 9.1.1. If non-emergency assistance is needed, call 601.856.2121, the dispatch center at police headquarters. Water fountains are available for your convenience, but we recommend bringing your own water as well. The City seeks to add extensions and more connections to the trail system when possible. Mississippi Department of Transportation (MDOT) installed new traffic lights along Highway 51 that feature a flashing yellow left turn signal. To learn more about the flashing yellow signal, read MDOT flashing-yellow-brochure. For more information about Transportation Programs, contact Chris Bryson at 601.853.2027 or chris.bryson@ridgelandms.org.